Keeping a track on the hundreds of small ToDos involved in a project or task is difficult enough. Making lists helps you to organize your work more efficiently and is a known technique for improving efficiency, reducing stress and keeping organized. Here to download are two ToDo Lists that may help you on your way. Both forms have a legend for shortcut suggestions for priority and Status. 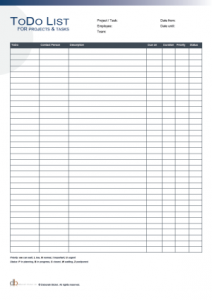 Usage: The forms are free to download and use. Copying, selling and redistribution is not allowed. © Deborah Bickel. All rights reserved. The first ToDo List concentrates on a single project or task allowing you to record up to 35 ToDos for “this project” on one form. A single form allows record fields for: project, employee, team, date range with entries for ToDo title, contact person, short description, due date, duration, priority and status. 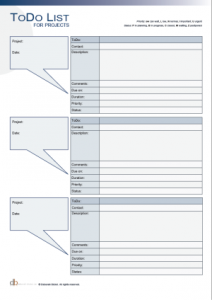 A good form to use for tasks or projects that require multiple small ToDos. Author and Copyright: © Deborah Bickel. All rights reserved. The second ToDo List contains three separate ToDo areas. Each one can be assigned to a different project or task. Each ToDo section has a larger description area, giving more space when you need to write more than a reminder keyword, plus entries for: project and project date, ToDo title, contact person, comments, due date, duration, status and priority. Useful for use during telephone calls and for small tasks.